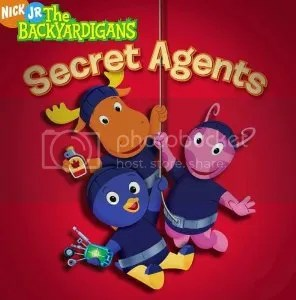 Those who have been keeping up with these reviews will notice that the theme of this episode is the same as “Pirate Treasure.” This is not because The Backyardigans’ creative team had already run out of ideas, but that they knew teamwork is an important theme for kids to revisit again and again. When it comes to social education, you really can’t have too much of a good thing. They also returned to traditional adventure genre with all the characters being secret agents. “Secret Mission” is pure, silly fun. Easily one of the best episodes of the season, it has costumes, gadgets, gizmos, sound effects, and Canadian maple syrup. Pablo, Tyrone, Uniqua are secret agents on a secret mission: to return a special artifact to a museum. Of course, being secret agents means that they can’t simply waltz through the front door, but must traverse laser beam-filled hallways, weight-triggered boobytraps, and the inevitable locked door. Naturally, all this is accomplished through the power of teamwork with a little zest of creativity. Working together with their various spy gear, the trio journey through the museum, overcoming various obstacles. Even after losing their multipurpose spy gadget, they continue on, finally returning the artifact to its rightful place, at the end of a dinosaur’s foot. Tyrone even has a chance to use his patented spy maple syrup – you never know what tools might be needed! This episodes makes clear, however, that cooperation is the greatest strength any team can have. There’s really not much more I can add to a practically perfect episode. The lesson is understated, yet clear, and the songs are amazing. The musical genre is tango, used very effectively in “The Treasures of Ancient Egypt.” “Laser Limbo” is probably the best song, as it is a brilliant remix of “Limbo Rock” and a great number to accompany an at-home limbo contest. We have now finished the The Snow Fort DVD, and will now continue our Backyardigans adventure on Polka Palace Party DVD, which contains the titular episode, “High Tea,” “The Heart of the Jungle,” and “Viking Voyages.” So watch this space next week for “Polka Palace Party”! How do you and your child cooperate? Fan Blog Alert: Talkin’ Toons Sound Bytes!